One of the joys of life is planting a seed, then waiting and watching as it turn into a glorious profusion of blossoms. The Seeds Community Garden began with the seed of an idea and is joyfully coming into full bloom. Thanks be to God! It began when some parishioners who share a love of gardening chatted about digging and planting together. One idea led to lots of others, but the seed was still on the table. Then one gardener remembered a discussion about using the pipeline right-of-way adjacent to St. Alban’s as a community garden, and the focus turned to that nondescript patch of land. Currently we have 41 garden beds with fruits, vegetables and flowers. We are using organic practices, so all the food that comes from our garden is healthy, and we are helping gardeners adopt practices that will keep the beds themselves healthy for years to come. SEEDS functions independently and we sustain our growth by collecting annual rental fees for the garden beds. New this year are our bees, who are very welcome to our garden and we have certified bee keepers also. 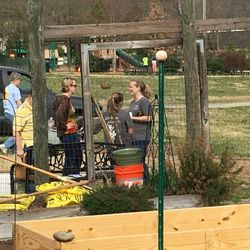 We have experienced a true sense of community in this community garden. Some families are giving all the fruits (and vegetables!) of their labor to the Loaves and Fishes pantry at Ada Jenkins. Indeed, we have said that at least 10 percent of all produce from the garden will go to local food banks or soup kitchens. Food for the body and for the soul -- that’s what our garden grows. 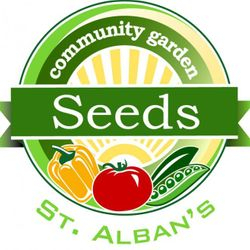 If you are interested in more information or in renting a space in our community garden, please contact Jean Bonnyman at jsbonnyman@fastmail.com.